← Divide and Conquer – the future of Syria? Christians are not the only minority group in Syria being persecuted, of course. I was speaking to a friend in Damascus last night and she told me that there had been massacres in seven Alawite villages. She knew personally of 136 people who had been killed because they were Alawites. Meanwhile the US and NATO move to give further aid to the very persons committing these massacres! Lord, have mercy on us! “It breaks my heart to think how our long history is being uprooted,” said Ishow Goriye, the head of a Syriac Christian political Hasakah. Mr Goriye, told The Daily Telegraph how, over the past two years he has watched as Christian families from Hasakah pack their possessions on the rooftops of their vehicles and flee their homes “with little plan to come back”. 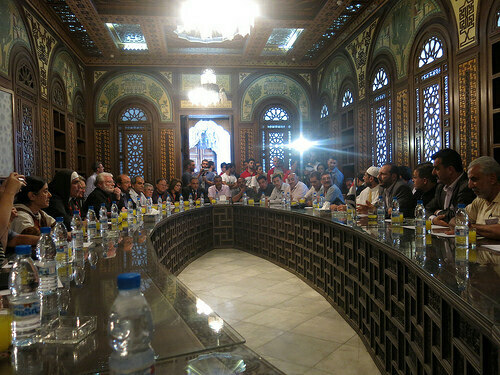 Mr Goriye’s Christian ‘Syriac Union’ party has long been in opposition to President Bashar al-Assad’s regime. While speaking to The Telegraph, its members were loath to criticise the opposition rebels, but many confessed that the situation had become “too bad” not to talk about it. One Hasakah resident who has now escaped the area said: “Rebels said we had to pay money for the revolution. My cousin is a farmer, and wanted to check on his land. I warned him he should take armed security but he refused. A group kidnapped him in the barn of his farm. We had to pay $60,000 [£52,000] for his release. They are milking the Christians”. Though accused by some opposition groups of supporting Mr Assad, much of Syria’s Christian community has avoided “choosing sides” in the war, seeking self-preservation in neutrality. Joseph added: “We are not with the regime. Many times the Islamists didn’t want us to join them in the demonstrations. We tried to participate but we were not given a role. It felt as though it was a strategy to force Christians out of the revolution”. This entry was posted in Article, syrian civil war and tagged Father Dave, NATO, syria, Syrian Christian, syrian rebels, US. Bookmark the permalink.